Versum is a web-based hair salon and spa management software that helps to streamline in-house operations and improve customer service. The software is designed for spa centers & beauty salons and supports features such as appointment scheduling, customer records management, staff management, and real-time reports. The solution offers tools to build a central information system which can be accessed online, 24/7. With Versum, salon managers can track customer visits and record information such as their booking history, preferred choice of service, the stylists and hair color they opt for, their last bill amount, number of visits, etc. The solution helps salon owners to connect with their customers by sending booking confirmation messages and appointment reminders via SMS text messages and emails. The solution is also capable of running various marketing campaigns through which salon owners can send bulk messages to their targeted clients. Robust marketing automation tools allow salon owners to not only stay in touch with their customers but also to improve customer retention through loyalty programs, special offers, and gift cards. 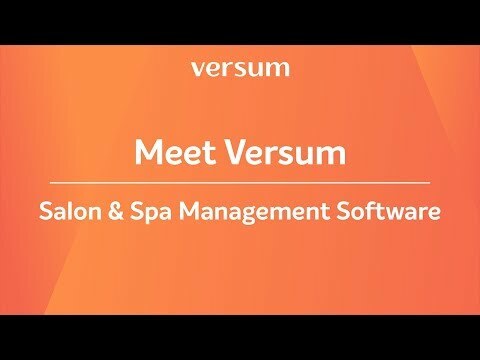 Versum provides an online service portal that helps salon customers to sign in, book appointments, choose service type, pay bills, and provide feedback. Versum is equipped with high standards of data protection that ensure the safety of sensitive data and customer information stored in the cloud. The solution is available on subscription basis and can be accessed on multiple devices at the same time using an internet connection. The solution is suitable for small and mid-size hair salons, beauty salons and spa centers. I have been with Versum for about a year now and I have been very happy after trying and overpaying to some other systems! Versum has everything you need, online scheduling, accounts, loyalty programme, reminders, marketing newsletters that you can schedule to be sent later, etc. It's also connected with google calendar and Facebook. It's quick and straight forward for a reasonable money. My clients love it, once they sign up (through Facebook for example), they can see their appointments history, loyalty points, they can choose their favourite therapist, time and leave us a message with their bookings, etc. They can schedule their next appointment within a seconds! Fantastic reports that keeps your hands on the numbers! Really great ad-ons if you fancy some extras but the system on its own is fully equipped. Customer service and support team is fantastic - quick responses and they are super friendly and chatty as well. They always go an extra mile to make sure you happy with their product and support and that you understand how to use the system, fully. I would 100% recommend it to any smaller or larger business who needs a reliable system. Thank you Versum!It's quick, doesn't freeze, doesn't go down, has all I need to run my business. Easy to use, can set a different access to a different staff members. The support team resolve quickly any concerns and adjust the system to your individual needs. After a failed attempt with a different version of salon software I couldn't have been happier to discover versum. The software is easy to use and incredibly effective within my salon. The online booking is great, all appointments are listed and easy to access, and this has been a preferred option for my clients as they can struggle to get me on the phone. I have also added gift vouchers onto my sales, the software generates an individual code for each voucher guaranteeing no forgery of voucher codes etc. Prior to each appoitment my clients are sent an SMS reminder, as well as a review email after their treatments which allows me to monitor all feedback effectively. The layout and design is easy to navigate and the price is more than fair for what you get. I would also like to mention the support from their teams has been incredible, always on hand to answer questions promptly to keep your day stress free! This software is one of the best I have worked with, everything flows well and the help forums guide you through any issues. •	Versum is a web-based solution that helps to streamline daily salon operations, acquire new customers and improve loyalty. •	Versum has a single repository for all client bookings and information and provides instant access to customers’ appointment histories, service preference, bill payments, and more. •	The solution allows customers to view available booking slots via an online portal and book appointments instantly. •	Salon owners can configure various loyalty programs and share offers & gift cards with their customers via email and SMS to increase customer engagement and retention. •	With inbuilt inventory management features, Versum lets salon managers track and monitor their stock levels and product sales. Below are some frequently asked questions for Versum. Q. What type of pricing plans does Versum offer? Q. Who are the typical users of Versum? Q. What languages does Versum support? Q. Does Versum support mobile devices? Q. Does Versum offer an API? No, Versum does not have an API available. Q. What other apps does Versum integrate with? Q. What level of support does Versum offer? Q. Which apps is Versum compared to most often?